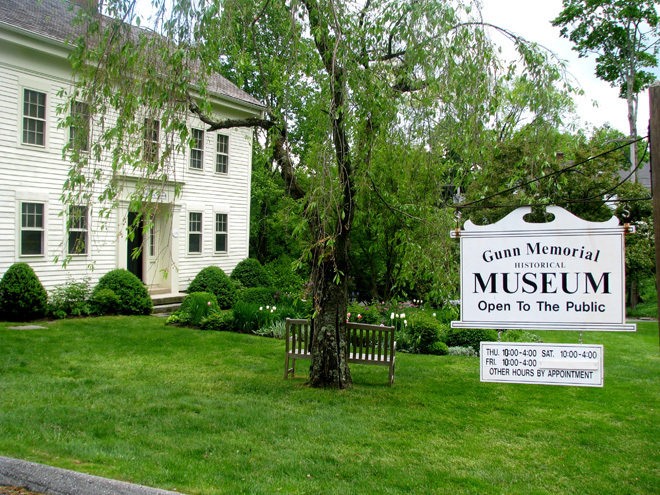 One of the most interesting, though little known, museums and libraries in Connecticut is the Gunn Memorial Library and Museum in Washington. 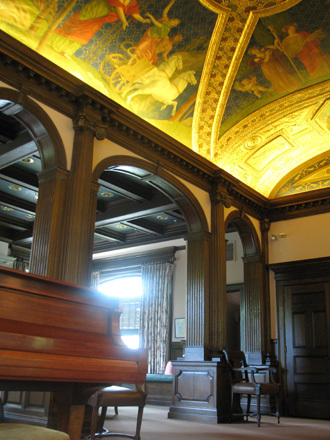 The Gunn Memorial Library building was built in 1908 as a memorial to Fredrick W. Gunn, the founder of the nearby Gunnery school, and to his wife Abigail. Their likenesses are captured on a large bronze tablet that adorns the front of the library. This attractive building lies to the east of Washington Green in a picturesque New England setting. Don’t be fooled into thinking that this is your typical library, with rows of books but little else. The exquisite architecture and stunning interior combine with impressive educational programs, to make the library the cultural heart of the community. The library is comprised of three main levels. the gilt-accented ceiling mural by H. Siddons Mowbray in the Wykeham Rooms. Here you will find the original main rooms of the 1908 library. The period detail is astonishing and everything is amazingly well preserved. Replete with oak paneling, pilasters and dentil moldings, it is almost as if you have stepped into a bygone era. The undoubted highlight is the gilt-accented ceiling mural by H. Siddons Mowbray in the Wykeham Rooms. Unveiled on July 4, 1914, the grand ceiling mural was donated by the muralist and painter, H. Siddons Mowbray, in memory of his wife. Mowbray’s work can also be seen in the nearby St. John’s Episcopal Church. The Gunn’s vaulted ceiling is divided into in four panels that depict the Greek myth of Proserpine, daughter of Ceres, being abducted by Pluto. The four seasons are represented, along with end-panel quotations from Emerson. 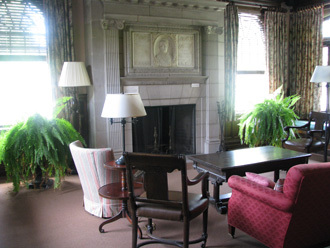 The climate controlled Connecticut Room contains local histories, genealogical information and historic photograph albums, as well as books by local authors. In the stairwell between the main and upper levels, and in the mezzanine between the Wykeham and Connecticut Rooms, is the stairwell gallery which mounts a new show by local artists every six weeks, including ONE’s very own Emery Roth II. The library has an extremely impressive collection of both traditional books and new media, such as audio books, DVDs and CDs. Whatever your interest, be it mysteries or classic fiction to historical reference books, you are sure to find something of interest. The friendly staff are on hand to answer any questions you may have, so don’t hesitate to ask. This houses the most recent addition - the Junior Library which offers an assortment of quality books and programs for younger readers. 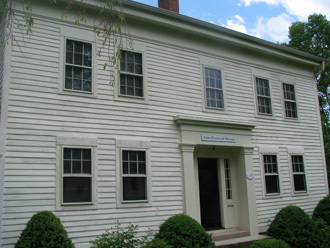 The museum’s collection dates back to 1899 when the local chapter of the Daughters of the American Revolution took space in a house on Washington Green for a historical room which they furnished in colonial style. When the Gunn Library was built, a basement room was reserved for this collection, to which Mrs. Orville Platt, the museum’s first curator, added her late husband’s collection of Indian artifacts. In 1964, Mrs. June Willis donated her adjacent 1781 house to the library. In order to free space for a children’s room, the historical collections were transferred to the Willis House, where they reside to this day. The museum hosts around three thematic exhibits each year, and the current exhibit “Life on Lake Waramaug: Past, Present and Future” has proven extremely popular. 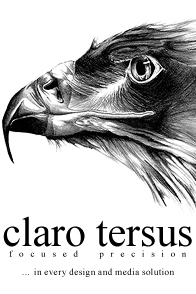 The exhibit runs through Sunday October 10, 2010, so if you are in the neighborhood be sure to stop by. Entry to the museum (and library) is free but donations are of course welcome. For opening times to both the library and the museum please visit their website.